IFC Midnight opens Dementia at the IFC Center on December 4th, 2015. NYC MOVIE GURU: What is appealing to you about dark themes? Gene Jones: Yes, I've done a few of those. [laughs] The thing that makes me want to do a film, first, is the script. I'm not a genre snob at all. If a dark script is good, I'm there and want to do it. I like the psychological game that goes with a dark role. As an actor, I never try to play evil people because I don't think that any person in real life thinks he is evil. I try to play the person justifying himself to himself and to others and who sometimes does horrible things. NYC MOVIE GURU: How do you find a character's emotional truth as an actor? GJ: I don't do much research. I'm not a researcher. I never approach things that way. I really stay with what's on the page and try to be as honest as I can be with the situation I'm given. If the writing is good, you don't have to go beyond that. You don't have to go to Wikipedia or somewhere on the internet to find your core. NYC MOVIE GURU: How challenging is it to find complex roles as an older actor? GJ: I've had some wonderful things come my way in the last 8 or 10 years. Good roles generate more good roles, it seems, in my case. Just last spring, I finished shooting a tiny role in Quentin Tarantino's The Hateful Eight. Of course, I wanted to work with him, so I jumped at the chance to do it. When I got there, I discovered that the little role had been written for me because Quentin had seen me in The Sacrament, so roles generate roles. I got an audition for The Sacrament because that director had seen me in a little comedy sketch, "Louie", Louis C.K. 's show. NYC MOVIE GURU: I hate the word "old." How do you feel about it? NYC MOVIE GURU: Would Dementia work as a play? GJ: I don't think so, but then again, they've made a play out of Misery, and it's running on Broadway. I haven't seen it, but I've read that it's pretty good. So, maybe Dementia would make a good play. I don't know. My first impulse is to say "No," but I'm not quite sure why I say "No." NYC MOVIE GURU: Do you think there should be more mental health services for war veterans? Would George, the character you play in Dementia, benefit from such services? GJ: I think you're right. Yes, I think that there should be more services and the services that exist now should be more quickly accessible for war veterans. I think that George would not have reached out for a service even if he had one on the next block and if his son had urged him to go. George is really a proud old guy, and I think he would not admit a weakness--certainly not that kind of weakness because he would see it as some kind of a character flaw instead of a mental health problem. I don't think he would've gone to such a place which, of course, leads him wide open to what happens when the home health care person moves in in Dementia. He can't ignore her, and he's in that place because he has chosen to go in alone. He's estranged from his son, and hardly knows his granddaughter, so they don't chat on the phone or keep up with him every day. He's cut himself off. When somebody makes their way into that closed-off place, she can get control of him pretty quickly. NYC MOVIE GURU: How do you imagine the relationship between George and his own parents? GJ: Probably something of the same with him and his son. I think that he was estranged from his parents and certainly from his father. George may have enlisted in the military to prove to his father that he was a man or that he could handle the training and go to wherever the war was, which he did. NYC MOVIE GURU: What do you think is so appealing about flawed characters? It seems that the more flawed a character is, the more interesting he/she is. GJ: That's just generally true, I think. It's very hard to play the hero in something. I'm certainly too old to be anybody's idea of a film hero or a theater hero, so I don't have that problem to wrestle with. It's very hard to play decency because everybody in our cynical times is always looking for the flaw in decency. I saw a great example of it a couple of weeks ago. I went to see an Arthur Miller play at the Signature Theatre called "Incident at Vichy." The situation is that during the early Nazi occupation of France, they're starting to round up Jews and people who they suspect of being Jews and question them. They release a few of them while they send some to a concentration camp and some they actually kill. One of the main roles is played by Richard Thomas, and I don't know how old he is now, but he has that same decent streak in him that he had in The Waltons all those years ago. He is just the best example of playing decency, I think, and it's very hard. NYC MOVIE GURU: You certainly have charisma on screen, but are you able to detect your own charisma? GJ: No, I don't think so. I'm very pleased and flattered that you think I have it, but it's not a calculation and not something that I know how to put into a role. I guess that people trust me to be honest with a character, I suppose that's what it is that you're talking about. It's a great compliment and I'll take it, but I don't know how I do it or what I do exactly. NYC MOVIE GURU: How would you define charisma? How does one become more charismatic when asked? GJ: It would be like telling someone: "Be more likable!" or "Be more trustworthy!". You can't calculate those things, but to me that's what it means. If somebody is likable enough to make you want to hear their story and to learn about the end of their story---to stay with them through a rough patch in a story. I don't know. I guess, you see it in all of its degrees in politicians. There are some politicians whom you know are totally intelligent and trustworthy, but you just don't give a damn about them. There is a chilliness or something that doesn't reach out. NYC MOVIE GURU: I believe that humanism is a truly special effect while CGI should be called "standard effects" instead? Do you agree or disagree? GJ: I totally agree with you. The thing that I like about what happens in Dementia is that everything that you see in it is humanly possible to do. 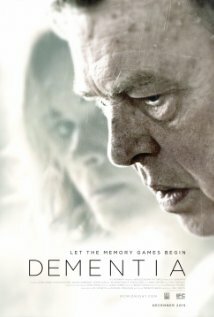 There's not a trick being played on you when you watch Dementia. NYC MOVIE GURU: How important is it for you to be attached to a film that has substance? GJ: That's what I look for when I read a script: is this story interesting enough? is it told well enough to really engage somebody for an hour and a half or two hours? Are you blowing things up and making a big noise every 5 minutes to hide the fact that there's not much humanism at the core? All of the human reactions including the agony in Dementia is earned, and it's real. It's based on a psychological situation, and all of these things are humanly possible to do. GJ: I don't know. I wish Dementia well. I also wish that it weren't being shown at 11:45 PM. I hope that it gets a wider release and a more general release time. It's asking a lot, I think, to ask people to come to a movie that starts at 11:45 PM. NYC MOVIE GURU: Do you think that Dementia would work in black-and-white? GJ: Yes, I do. I have not done a black-and-white film, yet, but I would love to do one. I love the old-fashioned, not just noir, but horror. Some of my favorite films are silent films like Dr. Jekyll and Mr. Hyde with John Barrymore. NYC MOVIE GURU: What would make an interesting double feature with Dementia? GJ: Me and Earl and the Dying Girl.